The NRA Range Safety Officer (RSO) Course is designed for NRA Certified Instructors, those responsible for range activities at their club or shooting facility, and any individual interested in furthering their gun safety and gun handling skills and knowledge. NRA Range Safety Officer program was developed in response to the demand for a nationally-recognized range safety officer certification. 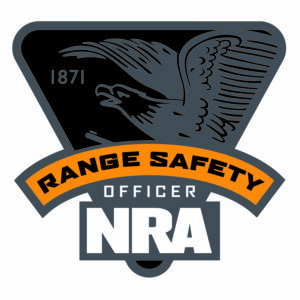 NRA Range Safety Officers are people who possess the knowledge, skills, and attitude essential to organizing, conducting, and supervising safe shooting activities and range operations. Candidates must receive 90 percent or better on the written exam for certification. This is an advanced 2 full day course and includes Chief RSO Certifications to those meeting the qualifications. A maximum of 30 candidates may attend a given course offering. Attractive certificates are awarded to candidates who successfully complete the course.